There has been a modest improvement in the public’s ratings of current economic conditions – while just 15% say the nation’s economy is in excellent or good shape, the percentage saying the economy is in poor shape has dipped to 35%, the lowest percentage since January 2008. 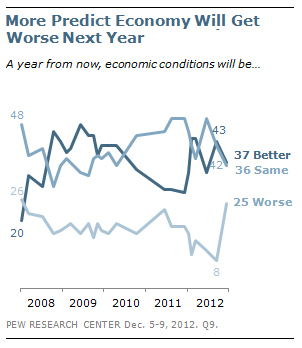 Yet the public’s future economic outlook has become more negative, according to our survey conducted Dec. 5-9. A quarter (25%) says the economy will be worse off a year from now, up from just 8% in September and the highest level since June 2011. Overall, 37% expect the economy to be better off next year, down from 43% in September. Republicans are increasingly pessimistic about the nation’s economy. Fully 47% of Republicans now say that the economy will be in worse shape a year from now, while only 10% expect conditions to improve. In September, just 7% of Republicans expected the economy to be worse off over the next year, while 35% expected conditions to improve. Independents also have a more negative economic outlook. Currently, 26% of independents say the economy will be worse in a year, up from 11% in September.